Actually, Renault Clio RS 200 EDC which is one variant of the hatchback hot-owned French manufacturer has been present since the International Motor Show (IIMS) 2013 years ago. Clio RS carries a 1.6-liter gasoline engine with injection turbocharger capable of producing peak power to 200 hp at 6,000 rpm, and peak torque of 240 Nm from 1,750 rpm. The Power is channeled to the front wheels through a transmission 'Efficient Dual Clutch' 6-speed. Basically this is a manual transmission with double clutch that can operate automatically. Sevara manual gear change can be made via paddle shifts behind the steering wheel. Clio RS uses monocoque chassis with MacPherson strut suspension at the front and torsion beam at the rear. Clio RS has been fitted with electronic differential called Diff RS by Renault. The brakes on all four wheels have been supported by ABS plus EBD, and control also helped with the traction control (ASR) and ESP. 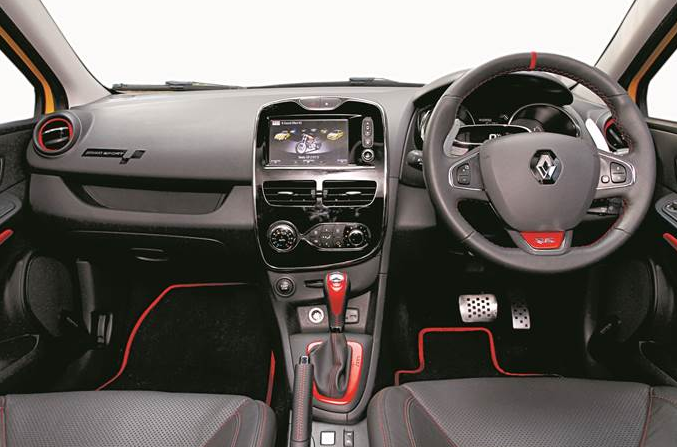 The cabin Clio RS can be said simply, with a combination of leather and plastic textures in some panels, plus the use of seat black bucket models that appear in contrast with the red safety belt makes it more sporty. Unfortunately, shiny black plastic frame in the middle of the screen head unit seem less suited to the car's sporty impression. In addition, traces of fingerprints easier looks at the shiny surface like this. But talking about the freedom cabin, Clio really satisfying. Legroom, both front and back were quite relieved, and with the presence of four doors, making access to the cab much easier, especially when compared to his older brother, the Renault Megane RS. 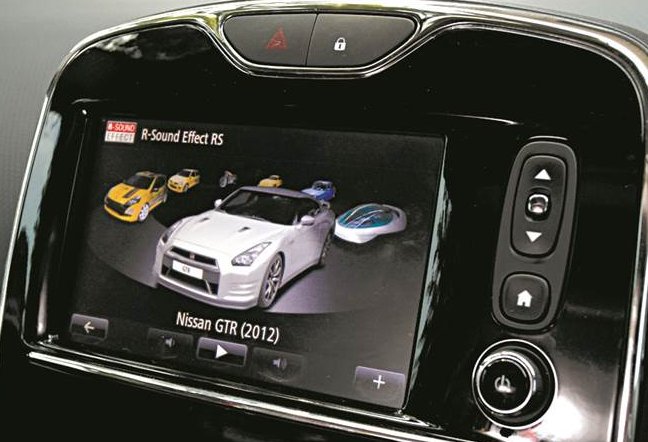 Head unit with touch screen displays various car settings, including an "entertainment" that is different for the driver and passenger Clio RS, the R-Sound Effect RS. This feature gives you the option exhaust sound that comes from a variety of different cars to be heard in the cabin through the audio system speakers. So, when driving, you can enjoy the engine sound of the Nissan GT-R in accordance with the input on the gas pedal you give the Clio RS. Very impressive, although over time in the cabin was too noisy. In addition, the GT-R-style sound seductive at the same time also brings hope for a similar performance Clio voice heard. But in fact, the response does not throughout Clio impressive sound in the cabin. Acceleration is not to put the body in a chair attached, even when the transmission is operated manually via paddle shift. EDC transmission response was 'slow' switching gear while trying to run after top speed. Changes that occur when pressing Hospital near the gear lever as well just give a little different effect. Of the claim provided by Renault, acceleration 0-100 kph in 6.2 seconds can be done, even intermediate acceleration from 80 to 120 kph can be achieved in a claimed 4.5 seconds in 4th or 5th gear. Even so, driving and control of the Clio was very convincing. When maneuvering fast, this car gives fine-grained control, with little understeer symptoms that are easy to correct. On the bumpy road, the suspension can not be said to be hard, it feels soft for a hot-hatch that on the highway gives smooth ride. In general, this car gives a very nice impression. Control convincing and smooth ride make it easy to adapt to this car. 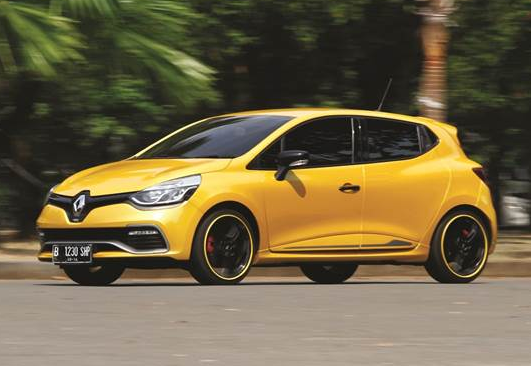 Moreover, in terms of design, it is very tempting, especially with Liquid Yellow color cast which is the exclusive colors of Renault Clio RS makes the owner will be the center of attention on the road. In addition, on the inside, the cabin is also very satisfying flexibility. 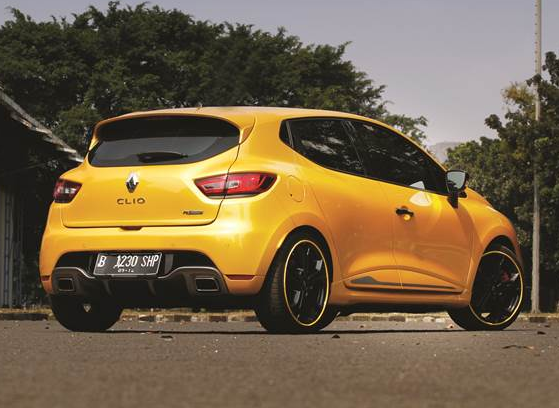 And that can not be forgotten, the entertainment provided by the Clio RS is not just an audio system but with a sound choice "engine soundtrack" R-Sound Effect RS, your driving experience with the Clio RS will be very impressive.